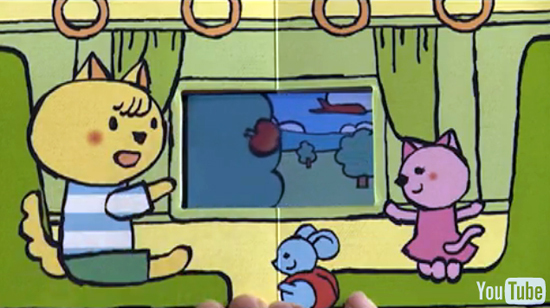 From the land of Hello Kitty comes this phone + book combo. Brilliant! Mobile Art Lab. 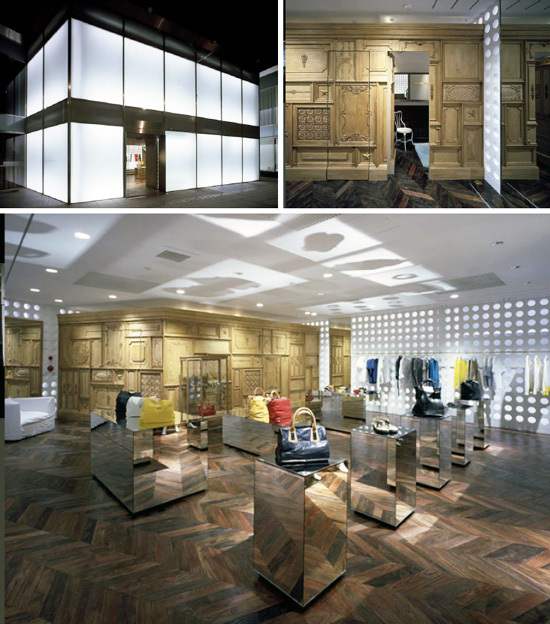 Detailed woodwork + white and light. 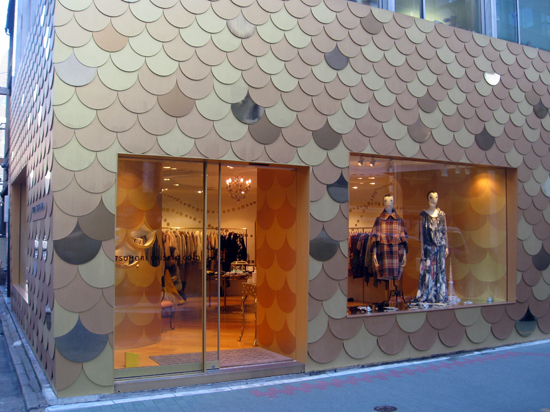 This flagship projects, reflects and plays a surprise hand in the store style stakes. Via Phillip Lim. 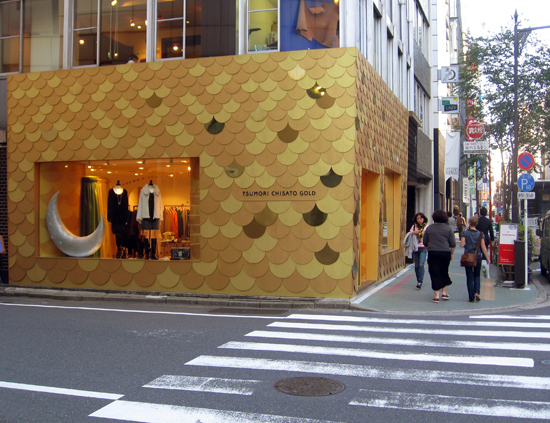 Tsumori Chisato Gold was a stand out on this Ginza corner. Imagine if I was filthy rich and had a chauffeur ... I'd miss seeing this stuff! (Actually if I was filthy rich I'd snoop & scribe permanently... anybody want to sponsor me?!). 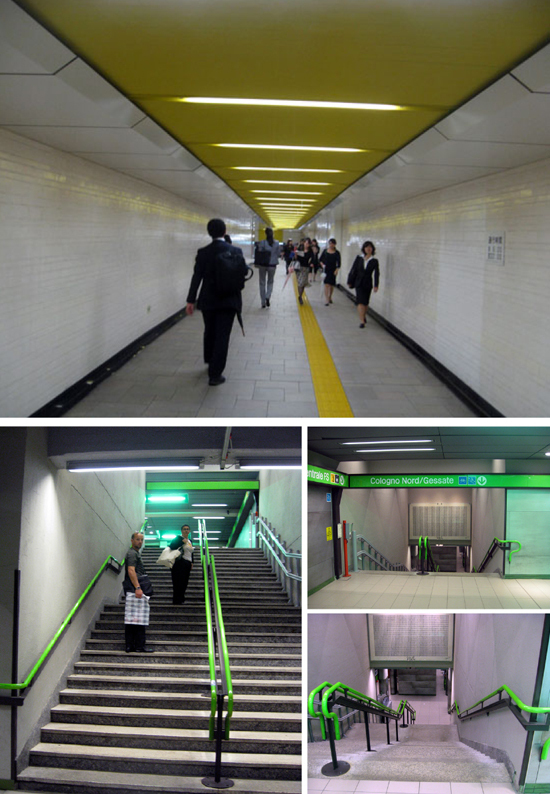 But back to reality and my subway sojourns... the yellow line was in Tokyo, the green line in Milan. I love no-brainer, colour-coded clues when I find myself in foreign places trying to fast-track figuring the transit system. If you're shopping with short people then why not make the floor fun and throw in a play pen of plastic bananas for good measure? The vibrant vinyl also makes it really easy for tall people to figure out where the brand starts and stops. On a big, busy floor plate I thought this was the pick of the bunch. 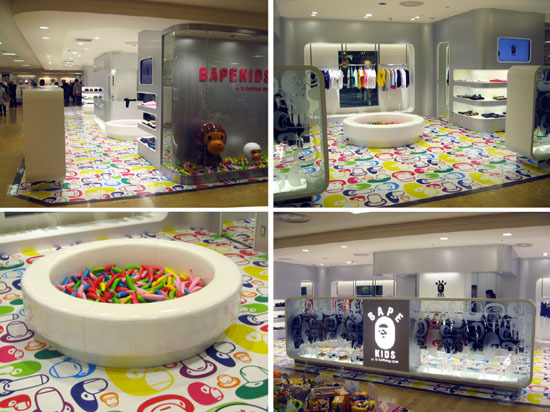 Bathing Ape concession, Isetan. Storm clouds in Ginza (actually, storm clouds is an understatement - I braved 2 days of typhoonal wind and rain so I could tell you about the Tokyo stuff - when in all reality I could have just stayed dry in the national museum or something normal like that). This is Diesel Black Label making a merchandising effort. Just so you know Diesel, I appreciate it. How cute are these future Captains of Industry cutting a deal (with their mothers no doubt!). 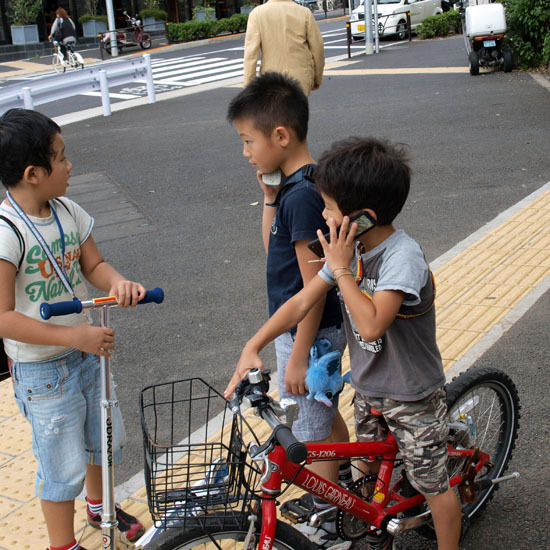 Couldn't resist snapping these tech-savvy tots. Spotted in Ebisu. It's 4 levels of fashion (I figured that out from the other side of the road). I liked the fact that you can see this fashion from afar. It reminded me that I wondered why, when standing on a different street in a different city, had David Jones (the iconic Melbourne dept store undergoing redevelopment) turned their back on Lt Bourke St and internalised their merchandising story? Who knows... but I'll see if I can find that pic and post it too. 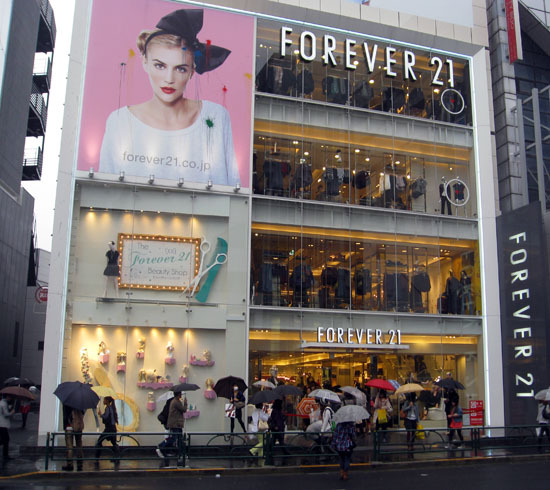 Forever 21 can be found on the big international brand strip (Top Shop, H&M, Gap etc) in Harajuku. From what I have read this store does phenomenal foot traffic (1000 lined up for the opening... 1,000,000 through the door in the first 2 months). Lordy I think I'll call it Forever Cash Up in future. I thought Harajuku Takeshita Street was hilarous (that statement obviously shows my age) - although it wasn't funny when the camera battery went flat (use it 16 hours a day and it will do that). 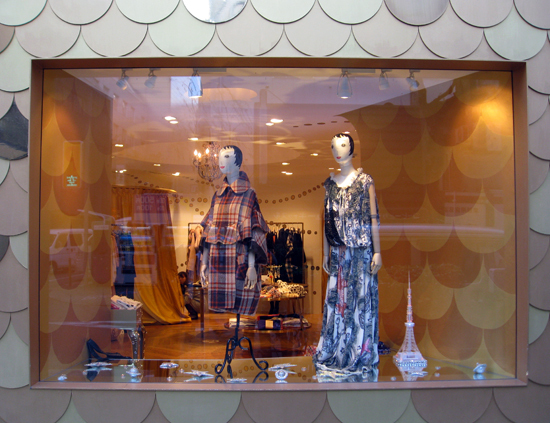 Takeshita Dori is for fast-fashion forward teenagers and emerging brands. It's also a great people perve and, although it is the width of a sardine tin and just as tightly packed, you really shouldn't miss it. 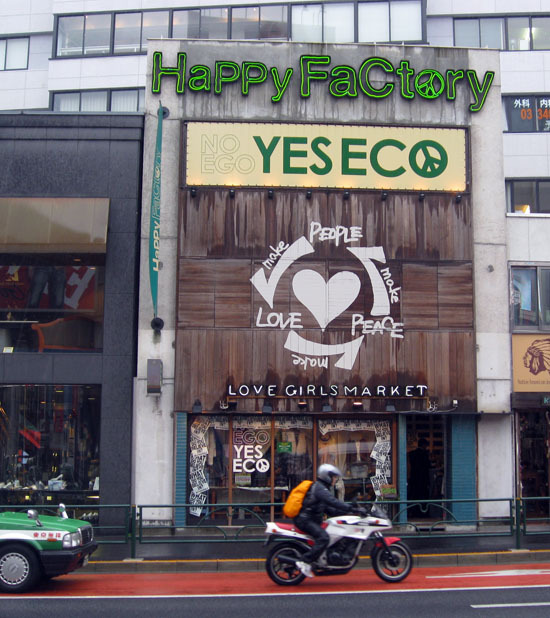 The Factory's recipe for happiness would appear to be 'drop the ego and go eco'. 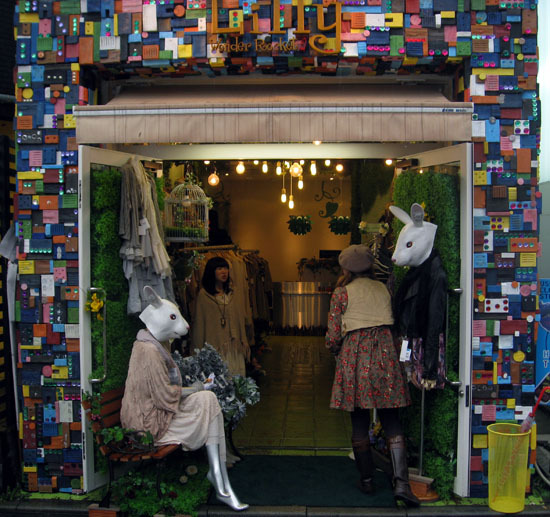 From my super quick snoop of Tokyo (48 hours) it seemed to me Harajuku just might be the love child suburb that channels the 60s. Peace man.